Ropecon 2016 has awarded Miska Fredman with the Golden Dragon award for his work as a prolific RPG game designer. Fredman is a long-standing accomplished designer, and his list of acclaimed games include the occultistic action rpg ENOC, the rpg “Fly” where the players live the daily life of said creature, and the upcoming futuristic battle game Sotakarjut (Warhogs). Especially well known are his youth-oriented RPG Astraterra and the grim and gritty Sci-Fi RPG Heimot (Tribes), which is now being translated into English ten years after its publishing date, due to the Hyperstorm- roleplaying game. In his daily life, Fredman works as a game designer for Colossal Order, a company known for its focus in simulation games such as Cities: Skylines. Ropecon especially thanks Fredman for his passionate and hardworking style; Fredman’s games are world class in their production values, and even his seemingly lighter, even satirical games contain depth and levels of playing provide gamers hundreds of hours spent in rich, highly colorful alternate universes and worlds. The Golden Dragon is an award given out by Ropecon once a year. The reward was first given out in 2003, and it is given for long-term work in the fields of roleplaying games, miniature games, card games or board games, for excellence in the industry or for a distinguished, impacting career to support and further develop gaming culture. The award is given out by a jury of experts. 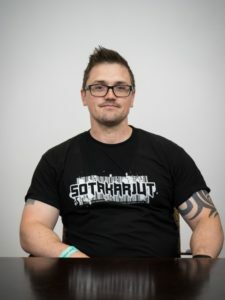 This year’s jury consisted of chairman Mika Loponen, Ropecon-veteran Jukka Seppänen, organizer and long-term active Heidi Säynevirta, award-winning larp designer Janina Kahela and, out of the Ropecon main organizers this year, Aaro Viertiö.